San Francisco’s condo market doesn’t need this sort of debacle at the moment. Condo prices are already under pressure. Sales volume has been down all year. The luxury end is in trouble. And South of Market, where this debacle is located – the epicenter of the building boom and until recently one of the hottest spots in San Francisco – is going cold. According to Paragon Real Estate, SoMa’s median condo price year-to-date fell 1.3% from the same period in 2015. And now SoMa has the Leaning Tower of San Francisco. Someday it might make a fabulous tourist attraction, much like its famous sister in Pisa, Italy, but for now it’s just an ultra-luxury debacle called Millennium Tower, the most luxurious condo tower in San Francisco and perhaps in California. But it’s sinking. And it’s not only sinking at an alarming rate – 16 inches since its completion in 2008 – it’s also sinking unevenly and has begun to lean. The tilt that began in 2009 has reached 2 inches to the northwest, toward the sidewalk on Mission Street, but it’s still not enough to where you can see it. We assume the tilt of the Tower of Pisa started out small too, and no one noticed at first. “That’s significant … and of concern,” said Professor Greg Deierlein, director of the John A. Blume Earthquake Engineering Center at Stanford University, who has been called in to evaluate the designs of a couple of San Francisco’s newer downtown high-rises. Deierlein noted that the 88-story Petronas Twin Towers in Malaysia — which were the world’s tallest buildings when they opened in 1998 – have sunk less than 3 inches. Their tilt, or “differential settlement,” is less than half an inch. “I would be concerned for my investment,” Deierlein explained. We’d think, as uninformed as we are about these things, that a 58-story ultra-luxury tower would sit on bedrock. But no. It’s a concrete building, and therefore heavier than steel-framed buildings, and therefore more prone to sinking, and it sits on a massive concrete slab that sits on big concrete columns that go down about 80 feet through mud-fill and sand near San Francisco’s shoreline before it was filled in. There’s no obligation to disclose to potential condo buyers that the super-luxury tower is not sitting on bedrock but sand. Other towers in SoMa are also concrete buildings and “have their foundations at the same subterranean level,” Johnston retorted. “In any case, this was not a cost-saving decision, but the preferred design,” he said. Not exactly comforting words for owners of condos in these other towers. And what does the Transbay Joint Powers Authority have to do with it? Ah, this is where the Leaning Tower of San Francisco is going to turn into an epic legal battle – and potentially a taxpayer-funded bailout of the owners. … is being built next door to the Millennium. It’s a huge construction site, snarling traffic in the entire area. According to the consultant’s initial report, by the time excavation began – two years after the $350 million Millennium was completed – the tower had already settled 10 inches. That was 4 inches more than its builders had predicted for the life of the high-rise. In other words, without the Transbay Transit Center construction project, no one would have even known about the problem. Condo owners would still be happy. Maybe a few would wonder about the uneven water in toilet bowls, but what the heck. The Chronicle also reported that “the Transbay Joint Powers Authority pumped more than $58 million into an underground buttressing system to shore up the Millennium before beginning excavation in 2010” – after it had already sunk the first 10 inches and before it would sink another 6 inches. However this will turn out, IF there are any solutions, they’re going to be expensive. And since the Transbay Joint Powers Authority – which is being blamed by the owners of the Millennium – is a public entity, taxpayers are potentially on the hook. This debacle is hitting the condo market in SoMA and more generally in San Francisco just when the hot air is already hissing out of it. The thing is: nobody knew that the tower was sinking at this rate until they studied it due to the big dig next door. The other concrete towers built on mud-fill and sand haven’t been studied, and no one knows if they’re sinking and leaning, and now doubts are likely to begin swirling. I’ve been a carpenter for almost 40 years, even though I have only worked full time in the trade for maybe 10 of those years. Even a first year apprentice knows you have to build foundations on either bedrock, or undisturbed substrate and re-inforce appropriately an acceptable design (slab on grade, grade beams, piers…whatever). In this case the builder/architech is at fault….and equally so is the SF engineering dept. Somebody signed off on the design….and now they are wrong. Wouldn’t it be lovely if it was a Trump tower? I accept the article is about the economics of this troubled industry, but that is also the point of the failure. Big money = big meddling with design and cost pressures. It would not be unreasonable to find bribes and payoffs somewhere along the line, either. 99.9% of engineers/archs follow strict guidelines that were written with wisdom based on past building failures. This is another ‘learn from this’ moment and a time to move on and improve standards and requirements. It may very well be that the City will have to subsidze a bail-out and may or may not be able to recoup losses from the builders. I am sure it will be a damn fine cash cow for the legal industry. Plus, think of how much fun this will be to have in the city as a landmark? “Leaning Tower of ______”. “_________’s folly”. “Look, before you build”. Maybe there will even be a resurgence of the ‘three little pigs story with economic winds instead of the big bad wolf? Plus, there is always a little joy in imagining rich owners tossing and turning in sleepless fury and dread. Last year they probably boasted or let slip where they were buying. Now? Probably not. It’s a freaking metaphor for the times, ain’t it? Yep. The lawlessness is trickling down into every nook and cranny of the economy. Nothing works, nobody is responsible, nobody cares, the taxpayers get the bill. Nothing special about lawlessness now. It was ever such. If there is any change it is that now it seems to more often become public. Pharaoh out of several millions? the jokes seem to write themselves! No more than it would be if it were a Moonbeam Brown, or maybe a Soros/ Berkshire project. Think of it as the punishment for an “Edifice Complex”. Tear it down and turn it into a greenspace. This is la-la land California that we are talking about. “Wouldn’t it be lovely if it was a Trump tower?” Please feel free to substitute the name of any other politician that you don’t like. In the San Francisco in which I grew up, a case of scotch was the magic passkey to get the building inspector on your side. I imagine that it’s a lot more than that now. We moved to Marin some time ago and enjoy everything having to do with schools, weather, people, food, prices, health, less stress and other amenities that make life pleasant. We can be in North Beach in less than half an hour. Why? Except for the opera and symphony, everything else can be found elsewhere. OK, the views and the walking around is nice in the city, in one small area. All the SF area needs now is for a large tech firm to announce lay offs. no tech trend grows to the sky. or, in old school, an iron law. We all know that the big earthquake is coming. Its not a question of “if” but of “when”. During an earthquake, this type of substrate is highly susceptible to liquefaction. The soils literally turn into a liquid slurry, and any structure depending on them for support suffers a catastrophic failure. How this building was issued a building permit by the authorities, with no provision for proper underpinnings, smacks of corruption. So, what’s new? Business in the Criminal States of America as usual. There’s no need to invoke old fashioned corruption, trust me. This is modern corruption, which is 100% legal. Just after finishing the Uni I worked as an intern for a year in a muni and those issuing building permits were not corrupt: they just knew if a design was presented by one big architecture/engineering firm of the area they had to sign on the dotted line even if it flew against the building code itself. Why? Because it meant “pumping money into our economy” and “a breath of fresh air for the muni’s coffers”. Yes, I actually heard both phrases. Most munis are perpetually flirting with insolvency or have caviar and oysters appetites but Big Mac budgets and need every penny they can scrap together. Building licenses and assorted fees are big (sometimes the major) items on muni budgets and it’s hard to resist the call of big cash waved under the nose. Those signing the permits tend to stop caring after a while. Unless a head on a platter is absolutely necessary (exceedingly rare when PA’s are involved, even in China… the Communist Party is not what it used to be), they just know the muni will take the hit. If somebody suffers damages because (real-life experience) a containment wall has been built with no foundations and no rebar, he will sue both the wall owners and the muni which authorized it. When the judge finds out the muni knew about it but issued the permit anyway, he will order both the owner and muni to pay damages and address the situation. The muni will refuse paying for as long as it can, but eventually the judge will force to cough up the dough, usually inflation adjusted. That money is so much money that taxpayers will have to pay, usually in form of a cut to the often questionable “services” they receive in return for their tax money. But somebody landing in jail? Come on! Issuing ever more building permits is a way to finance steadily increasing administrative costs without raising municipal taxes. Seems like a win-win. But by the time the bills come due (overcrowding, loss of nature), the officials are out of office, or safely retired. At least in China, the party if not the officials, bear full culpability for their actions. Yep peak RE nuttiness indeed in SF with so many condos erected in last couple of years and more in works. Really sums up the madness. I was working in the World Trade Center in the 80’s when a hurricane hit NYC. According to my boss, the buildings swayed up to 6 inches in the wind. He made me stand at the window and you could see the building’s movement by looking at the other tower. I actually got motion sickness. Yeah, well the same thing happens in Japan when a big quake hits. Pretty cheap condos for such a SF building. Pikers compared to Melbourne prices. “North of $10 million” could mean very far north. I wonder if Millennium Partners has their own in-house architects or if they outsource. Whoever they were, they are obviously incompetent. Short of this being a real life case of “The Towering Inferno” ,where the builders corrupt son in law allowed contractors to cheat on the design , I’ve got to believe this building was engineered and built to the highest standards in the industry. You just don’t throw up a 58 story tower in San Francisco without dozens of government agencies pouring over the design. Buildings taller than this are now routinely built on fill. This maybe a case of Donald Rumsfelds ‘unknown unknowns’, a undetected seismic fault or who knows. Seems a serious problem though for which an explanation and cure will have to be found. decision is the cause of the tilt and excessive vertical settlement of the Millennium Tower. One of my favorite stops in the USA is Mt Pleasant, Iowa to see how much more the Hy Vee store has sunk. Easy to see because the sidewalks are … or were getting sucked down with the foundation. Everything is slowly sinking evenly so nobody seems overly concerned about it. Leaning tower or leaning, stumbling imperial United Snakes Corp T-Rex. Ready for the impact repercussion? And watch out for that flailing tail! Exciting time watching this “Quickening” closing in on critical mass! I never could have imagined a 58 story building would not be anchored to bedrock – especially in San Francisco. well….considering it IS San Francisco, and considering The City is lying ON a major fault, ……’bedrock hardly matters……. I’ve seen the high rise condos go up rather quickly right as the Bay Bridge enters SF near Spear and Harrison (Rincon Pt) in obviously reclaimed/filled land along the Embarcadero waterfront. Something tells me that glut of condos represent the crescendo of the SF housing bubble to be followed by class action lawsuits against the builders by the home owners. I was getting mails from ambulance chasing lawyers begging to check my 9 yr old house I just sold for class action claims against the builder Lennar. that’s the big story right there….the high-speed….that really will not be high-speed…..rail will never be finished AND if by some miracle it is, it will never be used to the degree that is estimated. that train will go down as the biggest waste of money in California history…..but no, matter Dianne Feinstein’s husband is going to get rich off it……did i say rich? i meant RICHER!! Is the train idea still on? What happened to the bullet in a vacuum barrel idea a.k.a the hyperloop? Millennium Tower An appropriate name, they nailed it. Civil Engineering is quite the science, and any person/corporation building a 58 story high-rise in San Fran should have employed one who was wise to these concepts. As soon as this thing sinks another 120 ft, it’ll be sitting on bedrock. Now if anybody knows if bedrock moves in a major earthquake (I’m guessing “hell yes”), then we got a problem. The Leaning Tower of Pisa no longer continues tilting or settling. An ingenious means of strengthening the clay like subsurface was dreamed up and actually works. The tower will remain tilting for the tourists (How can you have a leaning tower that no longer leans?) but won’t continue tilting and eventually topple over. Assuming the building there were no legal violations of the building code, two questions come up. First ,were the codes considered standard in the industry.Did any engineers and architects question the viability of constructing structures that were not anchored in bedrock. So you really want to know what’s going on??? San Francisco has a very corrupt building department that has people working in it that is more concerned about something being done on their watch for fame a glory than doing the right thing. There are many buildings in San Francisco built the same way Millennium is built utilizing a floating slab and solid concrete. Most of has to do with newer building codes put into place after 911 which requires protected stairwells and concrete building cores, plus it is cheaper to building a solid concrete structure than one like the new Sales Force tower that is a mix of solid concrete core and steel floors. 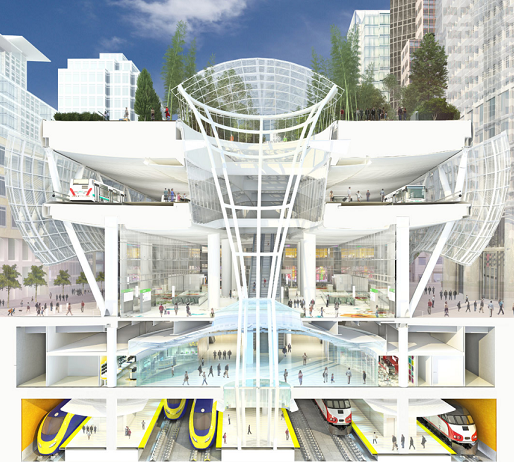 The Transbay Transit Center is another joke all together. You have another corrupt group of individuals that wanted their name on a building that will be nothing but a 2.4 billion dollar bus terminal. The high speed train that they claimed the terminal was being built for will never happen not to mention the tunnel that will have to be dug to support it at another 2+ billion. It is already over budget buy 1/3 million and the bleeding of money just keeps on going. So let’s dig a big hole next to a 58 story building, de-water the site as you dig, drill holes, for supports that go down to support the structure and not think anything else around it will be affected. RIGHT!!!! Blame it on global warming so the Federal Government will foot the bill. Notice the parallels … all the way down to the excavation site next door! There are other pics out there if you google around. 16″!!!! What happens to the plumbing in this building? Is this building going to be evacuated? 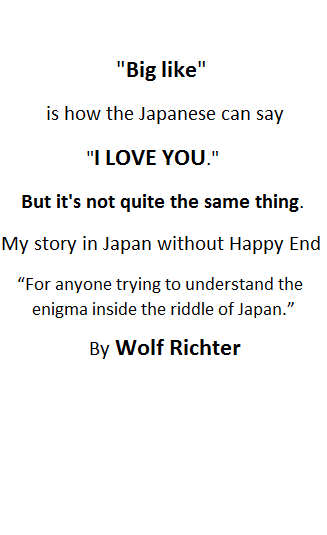 Wolf: Please refrain from using the word “epicenter” in your San Francisco stories. I would think that word would be one of the “Seven Words You Can’t Say in the Bay Area”. Building tall heavy buildings on fill material in a seismically active area is mind boggling. I recently asked a question regarding the cost of construction due to seismic concerns in SF. Perhaps it isn’t as much as your answer stated, especially if the developers disregard the need. If no one knew the building had sunk 10 inches beforehand and has sunk 6 more, how did the gas lines, power lines, and sewage and water lines stay intact? They would surely have broken . So they’re fixing those as they break. sorry, I went off topic. I haved lived in four different towers over the years. 3/4 have cracking or warping foundations, “bumps” in the hallways because the entire builing shifted, busting water mains at the base, ect, ect, ect. but I accepted these minor issues because this used to be a neat place to live. But now lawlessness is so bad that there is no point in living here. cant walk to places without being harrassed, public transport is filthy and dangerous due to angry thugs on board, ect, ect., ect. P.s. @Ricardo, drugs dealersa are making comeback in nyc too! (don’t know why gov can’t hold on to any decency like a civilized society should; no constancy at all in anything. corruption probably explains it). I would hate to be the president and owner associates of the geotechnical firm who designed the foundation for this thing. i pity the foo’s (sorry should change that to “condole the foo’s”) from SFO. NYC can sustain unlimited height to width ratios, and weights due to granite below. A 425 meter tower requires ONLY 16 meters of excavation to hit granite. That these high rises in a world class earthquake zone don’t go to bedrock should be criminal. But apparently building on piers a 100ft into mud is considered ‘safe’. Liquefaction under something this heavy and tall is a recipe for disaster. LA just permitted a big high rise tower in Hollywood directly ON TOP OF AN EARTHQUAKE FAULT IN VIOLATION OF STATE LAW. Until a few weeks ago, I rode BART into the city every day. I had a short ride, and the cars were usually so full I usually didn’t get a seat. About 4-5 months ago, I noticed I was getting to sit down more often, and just before I stopped riding Bart, I got a seat everyday. I knew the slowdown was coming, and fast. Same thing happened after the dot.com bust. Formerly full trains emptied out, and pretty soon the whole South of Market area was a ghost town. Took about a year. Building departments do not have the expertise to evaluate advanced engineering designs. The responsibility lies entirely with the engineers who did the design. The design calls for a certain resistance to be met when piles are driven. Many are involved in the inspections. No one would knowingly falsify or cheat. The facts are too visible and there are all levels of workers involved. Nature is at work. Subterranean resistances have changed. Rules of thumb, limits of structures are partially developed from cases such as these. In San Francisco, in the future, the resistances required for driven piles will go up as a result. DIRECT FROM THE MOUTH OF A TECHNICIAN WHO WORKED WITH A COMPANY THAT DRILLED INTO THE GROUND IN SAN FRANCISCO IN THE 1990’S. 200+ FT DRILL DOWN – WOODEN REMAINS OF SHIPS/WRECKAGE!!! 300+ FT DRILL STOP – THE FREAKING OCEAN!!! REMEMBER THE SUNSET DISTRICT LOOKED LIKE THE APOCALYPSE DURING THE LOMA PERADA EARTH QUAKE? THAT’S BECAUSE SF IS BUILT ON TOP OF THE FREAKING OCEAN!! THE LOST CITY OF ATLANTIS WAS SAID TO HAVE DONE THE SAME! Thanks, but please try to locate the CAPS LOCK key on your keyboard (usually on the left) and press it exactly once (not twice!!). This should solve your problem with ALL CAPS.